Scholarly research backs up common sense: fathers bring unique gifts to parenting. Talk of how fatherlessness contributes to community violence is a non-starter in some circles. Still, there is growing clarity on the role fathers play in child development. Established research confirms the merits of involved dads. Emerging research goes one step further, showing that men are actually transformed by the experience. 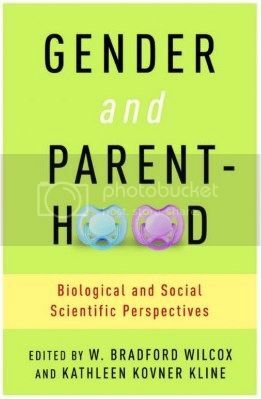 The new book Gender and Parenthood: Biological and Social Perspectives, edited by W. Bradford Wilcox and Kathleen Kovner Kline, lays this out. According to Professor David Eggebeen of Penn State University, there’s a social expectation for men to be involved fathers. It may be formalized through policies like extended paternity leave, or seen in pop culture references like A&E’s reality show, Modern Dads. What’s missing according to Eggebeen is a sense of what men are to do as fathers. At times, fathers have been thought of as a second mother – helpful, but not necessary. The research shows that fathers play a distinctive role in the lives of children. Eggebeen takes a close look at fathers’ unique contributions to teen development in a study based on longitudinal data. It measures 60 potential links between parental factors and teen outcomes. He found that fathers’ contributions often add to those of mothers. Of the 60 links, 20 percent were unique to fathers. This suggests that fathers have a distinct influence on teen development. He finds that the quality of relationship between father and child, including the sharing of activities, affects whether the child is depressed. Teen girls report fewer symptoms of depression when their fathers are more available. He also finds that a higher education level among fathers is linked to less depression in teens. Eggebeen also looks at how a father’s involvement affects teen delinquency. He finds that a father’s social capital –that is, community involvement and quality of family relationships – is linked to lower rates of teen delinquency. Eggebeen’s work is significant because it considers the interaction between moms and dads in teen development. In doing so, it isolates the unique contributions of involved fathers. It is true that moms and dads contribute many of the same essential elements to child development. Ross Parke, professor emeritus at the University of California Riverside, notes this in his chapter. Both parents are capable of providing the affection, nurturing and stimulation necessary for healthy child development. This is an important caveat when considering the unique role of fathers. Parke argues however, that moms and dads also contribute to child development in unique ways. This results from both social and biological influences on parenting. According to Parke, moms and dads relate to newborns similarly. Parental differences become more apparent during early childhood. Fathers tend to be more physical in their play, which is correlated with positive social development including less aggression among peers. Parke shares a similar concern with Eggebeen. He argues that ideas about how to father have remained largely undefined in our modern Western culture. Several scholars in Gender and Parenthood explore how fatherhood transforms men. Animal studies have found that both mothering and fathering are accompanied by biological adaptations. Studies on human populations in China, the United States and the Philippines have found that involved dads have lower testosterone levels. The study in the Philippines found the most significant drop among men who were partnered or recently partnered. Testosterone levels influence aggression and libido. Gender and parenthood co-editor W. Bradford Wilcox argues that falling testosterone levels among fathers may be nature’s way of settling men down to engage in caretaking. There are also economic benefits for married men. When men become married fathers, they tend to earn higher wages that also benefit their families. In summing the book’s findings on fatherhood, Wilcox told an audience at the Heritage Foundation that fatherhood transforms children’s lives and the lives of men in ways that are mostly beneficial. Wilcox told the audience that involved fathers are most likely to be found in intact, married families. Marriage remains the societal institution that connects parents to each other and to their children, for both economic cooperation and emotional intimacy. Wilcox argues that marriage ensures fathers are consistently present in their children’s lives. Questions remain regarding how to best support fatherhood. Wilcox argues that economic policy, civic organizations and cultural influences all have a role to play in supporting and strengthening fatherhood. We can also have a conversation about what fathering in the 21st century should look like. But first, the benefits of fatherhood must be acknowledged. That is when we can begin to understand the impact of missing fathers. Peter Jon Mitchell is Senior Researcher at the Institute of Marriage and Family Canada, a MercatorNet partner site. This article is reproduced with permission. Copyright © Peter Jon Mitchell . Published by MercatorNet.com. You may download and print extracts from this article for your own personal and non-commercial use only. Contact us if you wish to discuss republication.